eOne Entertainment releases Growing Up and Other Lies at the Quad Cinema on March 20th, 2015. NYC MOVIE GURU: What kind of advice would you give to aspiring filmmakers who want to write, direct and act concurrently? Danny Jacobs: Go to Law School. Darren Grodsky: Take the LSATs and don't even try. Danny Jacobs: Don't look back. First of all, working with a partner for sure because when one of us was on screen, the other person could be behind the camera. I really don't know how you could do a film with a budget like this without being able to have the time to look back at the monitor. We had a friend of ours, Chris Messina, who was in our first film, Humboldt County which we also co-directed. We made sure that we got what we needed every step of the way. NYC MOVIE GURU: How did you find the basic elements between entertaining the audience and provoking them intellectually as well as emotionally? Danny Jacobs: To a certain degree, we don't consciously think about the writing. Darren and I are pretty cerebral filmmakers in general, so it's a trap for us to think too much about how to inspire or excite people intellectually. A lot of it is just to try not to think too consciously about any one of those three areas, and just to sort of feel the film. The emotional component is the most important because if you're emotionally engaged, then you're entertained. The entertainment comes from being emotionally engaged and empathetic with the characters that are on the screen. Focusing fully on that is the answer to your question. If you really achieve what you set out to do emotionally, everything else--the intellectual and entertainment part of it---will, hopefully be there. Darren Grodsky: Every idea for a movie or a scene within a movie is a question of whether or not it's entertaining to us. Part of what's entertaining to us is probably, as Danny had mentioned, because we're cerebral. There's an intellectual component, but we're not thinking about that. Danny Jacobs: Our goal is not to think about it, but sometime we do. We knew were going to be doing a road movie on foot. We were, intellectually-speaking, asking, "What happens if we eschew the first act completely? What if we just start the movie right away, boom, where the road trip is beginning? Can we entertain the audience and engage them while doing all the things that the first 20 minutes of a film usually do, while they're already on the trip and as we let the audience catch up as they're going?" Darren Grodsky: It was challenging. There's a reason why those first 20 minutes exist in those road trip movies. There's a sort of easing of the audience into the characters and the story, but we did think about that and we like that kind of challenge. The root of that is that if there's something entertaining to Danny and me, it's something that we try to make it something that we haven't seen before. We have an interest to try to subvert our own expectations whenever possible because that's an exciting thing to do. We don't always succeed, but that's always the root of what we're going for. NYC MOVIE GURU: Do you think that the characters in the film will remain friends many ears later? Danny Jacobs: There's no definitive answer, but our own interpretation of that is equally valid. I don't think that they're really going to be friends---certainly not in the way that they are in this point of their lives. If we were to drop in on them in 10 or 15 years, they largely would have lost touch---not Billy and Rocks, though; they would be a little closer. Certainly Gunderson and even Jake will, kind of, wander from each other a little bit. They'll occasionally email, but I don't think they'll see each other all that often is my guess. Part of what was so interesting to us about this was that last gasp of a long friendship in life. In life, we have these chapters. People change. Darren Grodsky: In a way, the movie is about the end of this friendship or at least the friendship that was in its previous form. Jake, in particular, but everyone also comes to terms with the way they were and how they're not going to be that way. NYC MOVIE GURU: How would you define a good friend? Darren Grodsky: A great friendship is one that can immediately fall back into old comforts, even if you've been separated for a long time. We've all felt this. Even if you haven't seen that person for 5 years, within 5 minutes, you're as comfortable as you were when you were seeing each other on a regular basis. NYC MOVIE GURU: What advice would you give Jake if we were to ask you how he could be happier? How do you define true happiness? Danny Jacobs: We looked at a lot of films. A lot of the filmmakers include messages like "Don't give up" because that's how artists truly feel. There are those kind of people who are maybe good at something, but not great at something. We were really interested in the idea that maybe they're not cut out for this. What I would want to say to Jake is, "You'll be happier if you get rid of this idea of greatness. It doesn't mean that you're not going to be great, but that trying to achieve that ideal is going to cause you a great deal a pain." The question is that I don't know whether or not Jake would be capable of hearing that advice and really take it to heart. That's a problem for him. NYC MOVIE GURU: Is there anything truly wrong with being confused or stuck in life? Why is there a stigma about being confused? Darren Grodsky: I do think that our society is, sort of, designed around this idea that you find your passion and that you pursue that passion with as much verve and dedication as possible, and in the end it'll be the American dream. If someone is approaching his/her 30's, there's this confusion about, "Am I great at this? What is my passion?" Jake clearly has a passion for art, but some people don't because they haven't figured out what that passion is. There is, kind of a stigma where people say, "What's wrong with you? Why haven't you found your passion?" Danny Jacobs: We are in an age of self-help and of 12-step and this idea that something's wrong with the journey itself. Hopefully, that's emblematic in the film. This journey doing the island is the thing. Where Jake gets to at the end has a little closure, but it's not complete. What is he going to do? Is he going to Ohio? Is he going to be happy and find himself? I don't know exactly, but I don't think that's the point. Darren Grodsky: The definition of happiness is to embrace the messiness of life. That's what Jake and many people aren't capable of doing. I battle with it all the time. We want things to be orderly. It's very human to find a nice, linear progression to acheive our dreams, but reality is not like that. We would all be happier if we keep working and trying to progress while we embrace the messiness. Danny Jacobs: Darren and I share a life philosophy which is that we're all going to die, we're all expressing ourselves from the fact we're going to die. We're wandering around the planet with these creature that don't know what they're doing. The more we recognize that that's the case, and not delude ourselves into thinking that we're something greater than just that basic fact, then the happier we'd all be. NYC MOVIE GURU: Technology is advancing, but do you think that human beings are advancing along with it? How is the advancement of modern technology affecting the quality of human relationships? Darren Grodsky: It seems that when a new generation comes along, they have to re-learn everything about communication, relationships and embracing the messiness that the older generations already learned. That's the frustrating thing about human beings---each new generation learns what the old generation already knew, and has ignored those lessons because they didn't want to listen to their parents. Danny Jacobs: We are adaptive beings. There was an article that I read that was talking about how our brain used to be able to make certain connections in terms of recalling facts. If I want a fact, how to get home, put that fact in a certain file in my brain. Now, though, the brain is starting to remember places of how you find facts. There's a conversation that's taking place between technology and biology that's on-going and ever-present. NYC MOVIE GURU: Do you think that there's a shortage of films for adults nowadays? Darren Grodsky: Yes, there is a shortage of grounded, humanist films. I would say yes at any point. I can never have enough of movies that are humanist and make me feel things that take me on journeys. That's what I love about cinema. I enjoy seeing movies about superheroes and villains as well, and the thrill of the action. I wish that Hollywood would make more movies where I can have a shattering emotional experience, and that more of those movies were out and accessible. Danny Jacobs: I don't know if there's a dearth of films that are grounded in the way that you're talking about. What I wonder is if the mechanism by which these films are finding audiences is broken. When I go to film festivals, there are so many great little films that are wonderful, emotional, grounded, contained pieces, but then you go to the multiplex and it is what it is. The budget for advertising has to be so high to let people know about these films, so they never find their audience. The business side of it is broken. NYC MOVIE GURU: Would you agree that truly special effects are qualities like warmth, charisma, wit and subtlety rather than CGI which might as well be called "standard effects"? Darren Grodsky: I like that idea. The awe-inspiring aspect of CGI is not lost upon me, but I also agree that there's something that's even more special about a particularly charismatic performer who's emotionally inspiring and it makes you feel as if you're changed after having seen the film. If you want to call that special effects, I'm on board with that. NYC MOVIE GURU: What kind of film genres would you like to live in if you were able to design your life? Danny Jacobs: First let me start with the genres that wouldn't be part of my life: noir because it's too dark for me, a holocaust movie or war movie. I'd want to be in a combination of comedy, but not slapstick because it would hurt, a healthy dose of drama and a tinge of hard sci- fi---something like Alien or Moon. Darren Grodsky: I wouldn't want to be in a musical. It would drive me nuts. I'd like to live in one of Woody Allen's movies set in New York. NYC MOVIE GURU: How challenging do you think it is to find and express one's individuality nowadays? Danny Jacobs: I think that it's harder to find individuality than it used to be. The reason for that is because we live in a world of mirrors where everything is so quickly reflected back to us because we have visual avatars and reality shows so that we no longer exist in any kind of vacuum. I think that that vacuum used to be a place where you could discover who you are. Those places in our lives where we can self-reflect are getting smaller and smaller. Darren Grodsky: I agree. I think it's harder to find it, but maybe easier to express it because of all the social media platforms. I don't know if what people are expressing is actually individuality or if it's parroted snarkiness or parroted humor that sort of feels the same over and over again. Those moments of quiet reflection don't happen as often. Danny Jacobs: Darren and I are huge fans of the 50's and 70's culture in general in America. One of the things that he and I talked about is whether we could really have an anti-establishment movement today at could really exist because a movement like that would need to grow at a certain pace in order to build on itself and gain a certain momentum. Today, those movements are so quickly eaten up and then spit back out by corporation and advertisements. 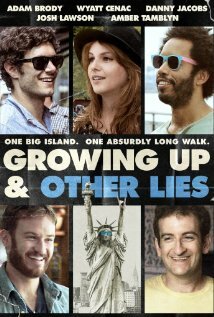 NYC MOVIE GURU: Which films would make for a great double or triple feature with Growing Up and Other Lies? Darren Grodsky: Diner, as well. Danny Jacobs: Stand By Me. I think that Husbands is the one that I'd be most excited to pair with this film. For some reason, a movie that just came to mind, and I don't even know why is one of my favorite movies of all time, The Rules of the Game. It's very different, but that movie taps into human relationships in such a real and naked sort of way, not that we acheived even 1% of the greatness of that film, but I would be interested in watching our film alongside that. Darren Grodsky: City Lights. It's a completely different genre, but another exploration of the fun to be had in an urban setting with a one of the greatest endings in cinema history---it's a complex, melancholic ending as well.